The Chancellor’s UK Spending Review is predictably more of the same failed austerity economics. George Osborne should remember the saying, “When you’re in a hole stop digging”. Despite previous cuts, his ‘hole’ remains a pretty big £118.5 billion deficit. A further £11.5bn of cuts will reduce demand in the economy, driving up welfare and other costs that simply add to the deficit. Only creating employment, enabling workers to pay tax and claim fewer benefits will take us forward. That requires borrowing, but as the IMF has shown, such borrowing can pay for itself. For Scotland, the Spending Review confirms a real terms cut in the Scottish Government’s budget of £333m between 2014/15 and 2015/16. The capital budget will have been cut by 26% in real terms since 2010. The ‘new’ money claim by the Secretary of State, is actually largely borrowing powers that have to be repaid from a reducing revenue budget. Robbing Peter to pay Paul doesn’t even begin to describe this nonsense. Instead of the promised growth, £3.2bn is being taken from the Scottish economy. A cut of 144,000 jobs, on track with the OBR estimate of 1 million job cuts from 2011 to 2018. It is always difficult to translate this into Scottish jobs, but I would estimate around another 40,000 jobs on top of the 51,000 that have been lost since the crash. The abolition of automatic pay progression. This doesn’t automatically apply to Scotland and we will have to wait until the autumn to see if the Scottish Government slavishly follows Osborne on this issue. We will be pointing out that the rate for the job is the top of the scale, so if you abolish the learning increments that will be a welcome, if unexpected, pay rise for many! As I set out at the start of this blog, workers in jobs pay taxes as well as spend in the high street, stimulating demand. I recently came across this interesting assumption in the Office of Budgetary Responsibility’s budget forecast: “Whole economy wages are expected to grow by 1.4 per cent this year and around 2.7 per cent in 2014, rising gradually to 4.0 per cent in 2016”. This means the Chancellor’s revenues are dependent on a pretty dramatic increase in real wages as the table below shows. Hard to see where that revenue is coming from given continued pay cuts in the public sector. This is not the only statistical slight of hand in today’s statement. Faisal Islam at Channel 4 claims to have witnessed “the most egregious statistical chicanery…in a Treasury fiscal event in 13 years of covering economics for newspapers and TV”. He is referring to the use of gross investment rather than net investment figures, in a blatant attempt to talk up capital spending plans. The reality is somewhat different because this government’s capital plans have a habit of not being delivered. Data from the Office of National Statistics shows that infrastructure spending in the first quarter this year plunged by 50% on the previous quarter and nearly 40% on the same period last year. This follows a 12% slump in 2012. Paul Johnson from the IFS said that, “the cuts in capital spending have been really dramatic, more so than the cuts in current spending…. there has been a bit of rebalancing, but capital spending has gone down a lot faster than other spending”. Then we have the awful Osborne cliché, ‘we are all in this together’. Of course we are not. Far from being fair, from quintile four downwards households are hit progressively more severely as they get poorer. So rather than the impact of the Spending Revue being felt evenly, apart from at the very top, low earners and the poor are going to take the hit to a far greater extent than middle to higher earners. More work for the biggest growth industry in Britain, food banks. Particularly when his vicious first week benefit cut for those his policies have driven out of work, kicks in. As this is Scotland, no announcement can be exempted from the independence debate and the Scottish Government’s response emphasises the choices we have to make. John Swinney is absolutely correct to say, “The Chancellor has chosen austerity over investment in growth and jobs and the cost has been the continuing deterioration in the public finances, prolonged recession and the downgrade of the UK’s credit rating”. However, he has someway to go convincing independence sceptics that his economic strategy would be that much different. The two Ed’s have a similar problem. While promising not to reverse Tory spending cuts is a well worn Labour election strategy, the economic circumstances today are very different. Six years of austerity economics will leave a deeply scarred nation with falling living standards, reduced services and even greater inequality. The real risk for Labour is that the voters will decide that if continuing austerity is all that is on offer, what will be the point in voting at all? The consequences of independence for Scotland’s defence have received heavyweight attention in a report published by the Scotland Institute. While this is clearly a defence establishment viewpoint, it is interesting because defence, Trident in particular, has been one of the selling points for independence on the left. The Scotland Institute brought together an impressive panel of experts chaired by Major-General Andrew Mackay, a Scot who served in the army for 27 years and commanded a Task Force in Afghanistan. In the report's foreword, he said: "I cannot see how slicing up a competent and well established military will aid either the United Kingdom or an independent Scotland. Indeed, I see very real risks to the people of Scotland, be it from the loss of jobs and the local economic impact that the inevitable removal of the Faslane naval base would bring, the huge costs necessary to start building the armed forces from afresh, the loss of access to sensitive intelligence materials and the inevitable dilution in the quality and number of the armed forces of this small island, which to date have had such a profound effect upon the course of world events." · Independence case is based on the flawed argument that the assets based here defend Scotland. They are part of integrated UK armed forces. 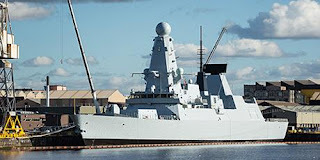 · Scotland would need to reinvigorate the Roysth naval base, not Faslane as it’s on the wrong coast. · The loss of economies of scale would result in poor value and a notional defence force. · A limited international role would make a Scottish defence force an unattractive proposition for recruits. · Creating a new intelligence service would be hugely expensive and ineffective. · Cyberattack is a major threat, but it would take £billions to replicate current arrangements. · Dispute over Trident bases would make accession to NATO difficult. · A notional defence force would result in the dismantling of the defence industries costing thousands of jobs. As the report sets out, it is difficult to assess what Scotland might buy for the SNPs planned £2.5bn budget without knowing how much it will need to spend on procurement. That sum is higher, at 1.7% to 2% of GDP, than the average NATO country spending (1.6%). However, it will also have considerable reorganisation costs and the equipment budget is likely to be about the cost of one submarine per annum. The planned 15,000 personnel would make the defence force one of the smallest in Europe – a significant constraint on international deployment. In essence, it will probably buy a territorially focused defence force shorn of high-end capabilities. Now a small, even if expensive, armed forces might not be of much concern to most on the left - as will be the lack of capacity to engage in international adventures such as Iraq. However, the impact on the conventional defence industry and the intelligence and cyberattack capacity is not so easily dealt with. High added value technology industries are not going to base themselves in a country so poorly defended and defence industries will go where the procurement possibilities are. The chapter on Trident is one of the weaker parts of the paper, but the NATO chapter is more interesting. Being a non-nuclear state is not an issue in itself where it not for the fact that Scotland is already a base for nuclear weapons. This may complicate accession negotiations and at the very least delay the removal of existing weapons. All the more so given NATO’s enlargement policy that requires new members to support, “the essential role nuclear weapons play in the alliances strategy of war prevention”. And please, let’s not drift into the absurd argument that Scotland somehow ‘retains’ NATO membership, or the EU for that matter. In conclusion, this report exposes the limitations of the SNPs current defence policy. As in other policy areas they seek to satisfy everyone and end up pleasing no one. You can have a small territorial defence force, but it doesn’t go with high-end defence industries and the consequential job losses. They have to decide which it is going to be. Disposing of Trident is undoubtedly one of the big gains from independence, but many remain sceptical that NATO membership may at best delay implementation of this plan. More work needed on defence in the White Paper and this report is a good starting point for anyone who wants to understand the issues. As long as you remember that it is a defence establishment perspective. Cross posted at Red Paper. Will new price rules give energy consumers a “simpler, clearer, fairer market”? Limit of four ‘core’ tariffs - for each of gas and electricity, and for each payment type. Suppliers will also be able to offer extra fixed term tariffs via collective switching schemes. End of ‘dead’ tariffs: If an old tariff isn’t ‘value for money’ then those customers will be moved onto their supplier’s cheapest variable deal. Suppliers must give customers personalised info on the cheapest tariff they offer for them and use the new Tariff Comparison Rate in all communications with customers. Ofgem will have more power to take action and fine suppliers who treat customers unfairly. A ban on price increases during the term of a 'fixed-price' contract. These plans come after research by Consumer Futures and the Joseph Rowntree Foundation shows vulnerable consumers pay up to ten per cent more for their essential services. The report, ‘Addressing the poverty premium’, finds that markets for the utilities and financial services are failing the poorest households in the UK. They call on regulators to put the needs of low-income consumers at the centre of their thinking about whether the markets are working well and to develop and implement consumer vulnerability strategies. The poverty premium can result in poorer households paying up to 20 per cent more on all their utilities (about £8 a week). Another approach is supported by EDF Energy. They are making the case for the single unit price to Ofgem and also calling for the scrapping of regional prices and standing charges. Which? Executive Director, Richard Lloyd, said: "Rising energy prices are the biggest worry for hard-pressed consumers but many people don't switch to save money because the market is too complicated, so it is good to see EDF Energy backing a single unit price for energy tariffs. Let's hope other suppliers now follow EDF Energy's lead and we see an end to confusing energy pricing soon." Many in the industry, including us, are sceptical that the Ofgem reforms will make much difference. The best that can be said is, as EAS say, they are a step forward if promoted. Customers could still be faced with up to eighty tariffs, double that if you take into account on and offline options. There is also no obligation for standing charges to be standardised. Most companies keep customers on standard tariffs that can be considerably more expensive and nothing in these rules appear to change that. Ed Davey may welcome the plans, but we doubt if many customers will. If this blog sounds a little smug and self satisfied, I make no apologies. I am entitled to a little job satisfaction! When the Scottish Government published the Police and Fire Reform Bill I did what I normally do with legislation that impacts on UNISON members - draw up an issues schedule identifying areas of concern or gaps in the legislation. The very first point on the schedule for this Bill was the conflict of roles between the Scottish Police Authority and the Police Service of Scotland. We therefore argued that there should be one board charged with scrutiny, leaving operational control the responsibility of the Chief Constable. We also pointed out that if it was constituted as a local government joint board, the force would save £millions in VAT payments. We made all these points and others to the Minister, Bill Team, MSPs and in the wider media. As we predicted the conflict was played out almost immediately. Not helped by the appointment of Vic Emery, who was previously the Chair of the Scottish Police Service Authority (SPSA). He immediately used the scope of this shoddy legislation to recreate the SPSA in the newly formed SPA. Instead of confining the role to scrutiny, he appointed all sorts of senior staff (often without competitive interview) to run finance, HR and IT functions. When MSPs and others queried the need for this duplication of roles, the SPA responded by saying, "people putting two and two together and getting five". No, we put two and two together and made four, that is duplication enough! In fact I described this as polishambles. What was portrayed as 'creative tension' turned into a mess as the turf war was played out in front of an increasingly exasperated Scottish Parliament Justice Committee. They also had the more harmonious Fire Service as a comparison. 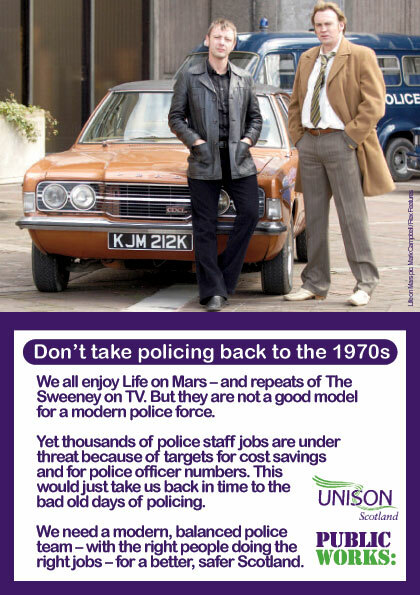 Graeme Pearson MSP led the political charge on this issue and today he summed it up well: "At long last officials have come together and many of the major governance issues have now been reallocated so that Police Scotland will be in charge of human resources, finance and corporate services etc. The SPA will do what it was designed to do: utilise governance and accountability by watching the way the service delivers according to the strategy." So today we are entitled to say, "told you so", because we did - and often. The legislation was badly drafted and many of the issues not thought through. The focus was on cost savings and centralisation, not good governance. Sadly, it is not the end of the story as there are still many other issues that need to be resolved. Not least the absurd police officer targets that have led to unsuitable and expensive police officers substituting for civilian staff. Now the Best Value implications of that are worthy of SPA scrutiny. But today is a good news day for police staff in Scotland. The aren't many of them - so enjoy! Careers websites like 'My World of Work' have a role, but they are no substitute for face to face advice. Particularly for those pupils who need the most help. I was in Parliament today for the presentation of a research report on the careers service by academics at Edinburgh University. The report was sponsored by our Skills Development Scotland (SDS) branch and is based on interviews with students and teaching staff. SDS management didn't cooperate with the study, which sadly says much about their approach. Lets not let evidence interfere with our cuts strategy! The latest staff survey finds that morale is very low, staff feel deskilled and that their professional judgement is no longer required. Nor is there much room for debate about how this service should move forward. For those of my generation who had a face to face interview with a professional careers advisor, being pushed towards a website seems a poor substitute. Looking back, I do feel a bit sorry for my long suffering careers advisor, faced with a string of lads all wanting to be an astronaut! My Gran probably should have been one, as she often said that I would make an excellent union official, "answer for everything that lad!". This wasn't a compliment! The research shows that common assumptions that all young people are 'digital natives' may not be helpful or accurate. In fact less than half use the MyWoW website and even fewer are registered. In addition pupils who were uncertain about their career ideas were less likely to access it than those who were more definite. Pupils highlighted the complexity of using websites such as MyWoW and in interpreting the information and relating it to their own circumstances. As a result most pupils who accessed MyWoW also used other sources of career information, advice and guidance (CIAG) including leaflets and books in the school careers library, face-to-face contact with careers advisers and discussions with teachers. A real concern must be that 17% of pupils did not have any CIAG in S4 (apart from discussion with their family). Non-activity was related to lower attainment, school attended and if pupils felt their school was not helping to develop decision-making skills. These are just the sort of pupils who most need support if they are not to end up without a job or training place. We should also take account of digital access out of school. Pupils and teachers valued MyWoW but as part of provision that includes face-to-face support, including from a careers adviser, for the majority of pupils. Compared with other sources of career support, MyWoW had a limited impact on pupils’ careers management skills as did the PlanitPlus website. Clinic sessions with a career adviser, discussion with teachers and use of the school careers library each had a substantial impact on pupils’ career management skills. In this context it is disappointing that SDS are not promoting face to face guidance. The overall conclusion is that while MyWoW is a useful resource, it is no substitute for face to face guidance and other forms of assistance. It confirms the evidence we gave to the Scottish Parliament's Education Committee in December last year. Some 100,000 pupils are assumed to be excluded from face to face guidance in the current plan. SDS and the Scottish Government should take note of these findings, stop the cuts and promote face to face careers guidance - not hide it away! This evening I participated in a ‘Question Time’ event organised by Brodies Solicitors on the subject ‘Beyond 2014 – The Future of Employment in Scotland’. I was pleased to do this event as employment considerations have been sadly missing from the constitutional debate so far. So what might employment look like after 2014 if Scotland was independent? As with most issues we need to see what the White Paper later this year has to offer. However, there are some hints in the Scottish Government’s recent paper on the economic case for independence. They highlight the importance of integrating policy levers to end the current disjointed approach. This might enable action on a living wage, gender and worker representation on company boards and tax incentives to encourage firms to take on more workers. They point to the example of other countries in Europe that have better benefit systems that allow people to move more quickly back to work and fiscal incentives for training and skills. They also offer the prospect of some form of social partnership and bringing employment related matters under an Employment Rights Authority on the Irish model. All this sounds promising if a little vague. Exploring mechanisms isn’t quite the firm offer trade unions would want to see. When it comes to the detail of employment rights Scottish ministers have been somewhat vague when pressed. The Yes campaign’s response to the STUC Just Scotland initiative was equally vague on labour market reform, pointing to the opportunity to take a different path from Westminster. It’s a delicate balancing act keeping your business backers on board while appealing to the workers at the same time! On a more practical level we can draw some conclusions from our experience of employee relations since devolution. On the whole I would describe them as positive across all the administrations since 1999. The Memorandum of Understanding with the STUC has underpinned a positive level of engagement between the trade unions and government at all levels. The recent statement on the constructive contribution made by workplace unions to economic growth is a document that you would be unlikely to see emanating from the present UK government. The partnership model in NHS Scotland has been described as probably the best model in Europe in a recent academic study. The Scottish Living Wage, civil service facility time and minimising compulsory redundancy have all been positive aspects of employee relations in Scotland. Of course it hasn’t all been plain sailing. The current pension disputes and pay policy have looked pretty much the same in Scotland. Only this week I was addressing the Scottish Government’s approach to regulation that uses similar language to that the UK Government uses to justify undermining employment and safety legislation. Of course either side can take comfort from these examples. They have been delivered under devolution, but could also reflect a different, more collective approach in an independent Scotland. UNISON’s Fairer Scotland – Devolution paper sets out the case for devolving more powers including safety, labour market regulation and equalities. While the driving principle is subsidiarity, the paper admits that there is a case for simply doing things differently. And that is ever more pressing when you have a UK Government undermining the UK’s already weak safety and employment laws. Important though the mechanisms of employee relations are, employment depends on wider economic and social policy considerations. The questions at tonight's event reflected those concerns ranging from immigration, taxation, pensions and Europe. As I and others have highlighted elsewhere, there is a real contradiction between the low tax business model and greater social justice. Jim McColl and Nicola Sturgeon can’t both be right and this is something the Yes campaign is going to have to reconcile if they are to develop a credible case for independence. Equally, the No campaign has to offer a vision of extended devolution that addresses how Scotland can develop a more integrated approach to employment issues. Much more work for both sides on this issue and thanks to Brodies for promoting the debate. The main provisions of the Regulatory Reform Bill are based on the false premise that regulation somehow damages growth. Rather than improved regulation the proposed bill could damage good regulation. Today I gave evidence to the Scottish Parliament's Economy Committee on the Bill. The Bill gives ministers powers to introduce national regulation systems and places a duty on listed regulators to exercise functions in a way that contributes to achieving sustainable economic growth. There are a range of environmental regulatory changes largely affecting SEPA and powers for ministers to interfere in local planning administration through a performance management framework. As a consequence the Bill can be seen as part of the centralising tendency of the current administration. Nobody supports regulation for its own sake, but it is important to state the case for good regulation. Regulations don’t just protect the public from unscrupulous and dangerous practices they protect other businesses as well. Companies who don’t follow the rules can offer a cheaper and/or faster service. This makes it difficult for those who do the right thing to compete. 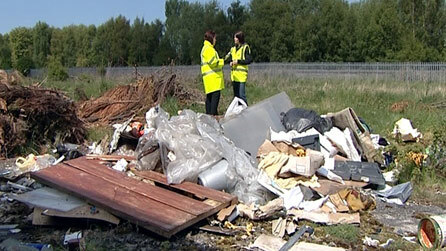 Fly tippers can charge a lot less than those who pay to have their waste disposed of or recycled. This drives down profit margins and increases costs for taxpayers who have to pay to have streets cleaned. The Scottish Government’s claims that it wants to make Scotland “healthier” and “safer and stronger”. Should this not be the focus for a Bill claiming to improve regulation? Scotland has the highest level of E-Coli infection in the world. Three people died in the last outbreak of Legionnaires’ disease in Edinburgh. Days are lost at work through accident or ill-health caused by poor food hygiene, substandard housing and accidents at work. All of these are a greater burden on our economy than adhering to regulations. A key area of discussion this morning was the proposed duty on regulators to contribute towards achieving sustainable economic growth. This is ill defined and could confuse the role of regulators to keep us safe. It is also likely to encourage legal challenges that will be another burden on hard pressed staff. Even the threat of legal challenge could influence regulatory activity and big firms rather than small are likely to be the gainers. The Scottish Government is also proposing to take major powers of direction that could further undermine local democracy. UNISON has on occasion been critical of local authorities for reinventing the wheel, when some strong guidance from CoSLA would have ensured greater consistency, without undermining genuine local responses. However, the solution to that difficulty is better coordination and best practice guidelines, rather than imposition from government. However, the greatest interference in local democracy is undoubtably the proposals to link planning fees to performance. The irony of Scottish ministers promoting a Blairite top down performance management framework is remarkable. Have they learned nothing from the dismal failure of top down targets as a way of driving improved performance? Hospital waiting times anyone? All the evidence shows that other services suffer and staff are forced under pressure from above to game the system. For example, planning applications close to target date that could be dealt with by some discussion with applicant, will instead be rejected and have to be resubmitted. Target met, but everyone unhappy. System thinkers have been highlighting this for a decade or more. The RTPI also reminds us that the needs of developers should not be paramount when they say, “It should be borne in mind that the customers of the planning system are not only those applying for planning permission. Any discussion on planning performance needs to recognise that planning is a public service that provides a service for society at large, as well as those who are directly engaged with it". Today we are also publishing the results of a survey of our members in planning departments. They set out the reality of huge pressures on the service caused staffing cuts. Overall, 87% believe the service provided to the public is being adversely affected. These are the issues the government should be focussing on. Parliament can give regulators more powers and duties, but if the staff are not there to enforce them they are meaningless. The primary purpose of regulation is to ensure that Scotland is a safe place to live and work. It is the job of our members to ensure that, not to juggle that role with an ill defined responsibility for economic growth. The key provisions of this Bill are simply unnecessary and reflect the increasing centralisation of powers away from democratic local government. Fair pay for Scottish council workers is fair for them and fair for the local economy as well. 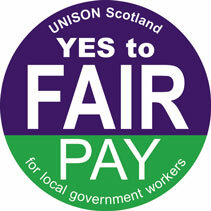 Today is the first Fair Pay Day in the run up to a strike ballot by Scottish local government workers. The employers have offered a 1% increase and a Living Wage of £7.50 an hour (to be applied after the 1% rise). This follows a two year pay freeze during which council workers didn’t even get the government’s £250 underpinning for the low paid. During the last three years, most local government workers have seen the value of their pay fall by nearly 13%, while living costs soared. Inflation saw prices rise by 11.2% (RPI). The UK currently has the highest food and energy inflation in Western Europe. The UK Coalition Government’s austerity programme has led to council workers paying for a crisis that they didn’t cause. Pay freezes, job losses, increased workloads, cuts in working tax credits and in-work benefits, huge rises in food and fuel costs. Meanwhile, the wealth of the richest 1000 people went up by £116 billion. They could pay off the UK deficit three times over. While it is true that Scottish local government is under financial pressure due to the cuts, many in local government recognise that expecting council workers to bear the burden of the financial consequences is not sustainable. Some councils budgeted for more than 1%. Most have been building up their reserves as the total unallocated reserves increased by 23% last year. We calculate that councils have saved around £860 million from job losses during the pay freeze and more than 34,500 jobs have been lost since 2008. We are also storing up long term problems. Our members’ personal debts are growing with 22% reporting debts of £10,000 or more and 27% increasing credit card borrowing. As a consequence, 71% are cutting spending on family activities, 45% on physical exercise and 31% on health treatments. So it’s affordable and fair for council workers but what about the local economy? Council workers are the lowest paid group of public service staff. We know that low paid workers will spend much of their fair pay and Living Wage in their own communities – building the local economy. A study by APSE on the Economic Footprint of Local Services estimates that local government employees re-spend 52.5p of every pound in their pay locally. A similar study in Stoke put the figure at 63p. Today the TUC has published an analysis of pay in the UK as part of their 'Britain needs a pay rise' campaign. They show £52bn being lost from local economies including £5.5bn in Scotland. In fact pay in Scotland has fallen 9.7% compared with 7.5% for Britain as a whole. A lot more work has been done on this in the US including a recent report on the cost of Walmart stores paying basement wages to the local economy. A study by Demos provides further insight. It found that if wages rose to the equivalent of $25,000 per year for full-time work, more than 700,000 Americans would be lifted out of poverty, GDP would grow between $11.8 and $15.2 billion over the next year, and employers would create 100,000 to 132,000 additional jobs. The falling share of GDP going into wages and the concomitant rise in profits means we have an increasing pool of capital for destabilising speculation, while the workforce becomes increasingly reliant on debt. This is a primary cause of the longest and deepest recession in our history. Scottish council workers have actually paid for their own pay rise several times over. Not only do they deserve a fair increase, but it’s good for the rest of us as well. Fewer homes are being built in Scotland than during the depression of the 1930s, leaving us with a housing crisis that needs a radical policy response. Today, UNISON Scotland offers such a response with the publication of our new housing policy. Shelter tells us that the figure for 2012 of 14,877 completions was the lowest number since 1947, when 12,149 houses were finished. It was also worse than the low point reached in the Great Depression when 17,544 homes were completed in 1932. They estimate 465,000 new homes need to be built by 2035 to meet demand. We spent a lot of time time talking to our members in housing while developing this policy. We covered lots of issues, but everything came back to one simple truth - we just need to build more houses. And the primary need is social housing. The Scottish Government describes social landlords as, ‘the providers of homes for the most vulnerable in society’, as ‘a safety net at a time of personal crisis’ and as ‘a first home before entering owner occupation’. We think that's the wrong approach. The market has not and is not interested in meeting the real housing need in Scotland. That's why we need to make social housing central to a new housing strategy. Houses that people can afford and want to live in. Fine you say, but how will you pay for it in these straightened times? Well paying for housing isn't a big problem as there is rental income that can cover the building and maintenance costs over the life span of the building. The problem is financing the capital cost. The banks won't lend at rates that housing associations can afford even if the money was available. So our solution is to tap into the vast assets of our Scottish local government pension funds. £24bn, almost half of which is invested outwith the UK. The workers and employers who paid for these assets would rather their cash was invested in local housing than lining the pockets of City fund managers. Building houses is much more than simply putting a roof over people's heads. It will provide jobs in the public and private sector that will help kick start the economy. It will also make a huge contribution to tackling health inequalities, probably Scotland's greatest policy challenge. Talk to any community nurse, health visitor or social worker and they will tell you about the impact cold, damp, overcrowded housing has on the health of their clients. It makes financial sense as well. If we are serious about preventative spending why are we wasting scarce resources on temporary accommodation. This year alone Glasgow has spent over £24 million and Edinburgh over £30 million. To this you can add £millions on the health and social consequences of poor housing. And by the way, we can also make a real contribution to our climate change targets. Private sector tenants need secure affordable homes too. They require a proper system of rent control, improved regulation of landlords and decent housing standards. Of course, rent controls, regulations and standards are only effective as long as they are enforced whenever necessary. But most importantly a new housing strategy will transform the lives of hundreds of thousands of ordinary people by providing a safe comfortable home so that they and their families, their communities and ultimately our society can reach their full potential. Cuts in capacity at Peterhead gas power station highlights concern over gas prices, transmission charges, the supposed ‘dash for gas’ and plays into the independence debate. Another good energy story from Steven Vass in yesterday’s Sunday Herald, covering the decision by SSE to slash capacity at its Peterhead gas fired power station by two-thirds from next year - from 1.1GW back to just 400MW. They insist this will have no impact on Peterhead’s CCS demonstrator bid in the UK Government’s £1bn competition. The company is blaming the uncertainty around electricity market reform and the transmission charging system that discriminates against northern generators further from the centre’s of population – the same reason that prompted a previous reduction from 1.8GW three years ago. The high gas price is likely to be another factor. SSE has previously warned of generation capacity problems in the UK. They are making a pretty substantial contribution to those concerns with their own capacity reductions of more than 2.5GW. The company has also written down the value of its stations by £278 million. “Dave Watson, Scottish Organiser of trades union UNISON, said that Peterhead was "pretty vital" to the Scottish system. The more you rely on intermittent renewables, the more important the station becomes," he said. "Ofgem's new proposed system of transmission charges will be better than before, but it doesn't mean companies like SSE are happy. It's still not doing all the things that they would want it to do. They still feel Ofgem hasn't moved from its basic ideology that power should be generated nearer the market." For once I agree with Scottish Government Energy Minister Fergus Ewing that SSE's decision was, "yet another warning bell to the UK Government over the uncertainties being caused by delays to electricity market reform". However, I am less convinced over his view that this demonstrates the, “continued importance of Scotland's role as an energy exporter to the UK as a whole”. You could reasonably argue the opposite. The decision also has consequences for the Chancellor’s ‘dash for gas’. Energy UK, the industry association, wrote to Westminster Energy Secretary Ed Davey saying clarification of the role of gas-fired power for the future was "urgently needed". A Westminster energy forum last week was told the UK "dash for gas" is more of a crawl as big uncertainties remain over supply, demand and policy. In fact Environment Agency chairman Lord Chris Smith expressed concern over a spike in coal-fired generation. He said "We are in the midst of a dash for coal," as cheap US shale gas has displaced coal onto the global market and brought prices down. This led to a "distressing" 11 per cent rise in sulphur dioxide emissions last year, which had previously been on a downward trend. On gas prices, the Guardian highlighted that some of Britain's biggest energy suppliers were holding back gas in storage tanks at a time when the market ran into an acute shortage two months ago, triggering a doubling of wholesale prices. This triggered further concerns over allegations of market manipulation. Ofgem and the Financial Conduct Authority have been urged to act to ensure markets work more efficiently and transparently as they have so far failed to act on whistleblowing allegations made last November. Meanwhile, the price of wholesale gas has now fallen back to 70p per therm, but still remains unseasonally high and compares with 57p a year ago and 28p in May 2009. SSE’s Peterhead decision reflects wider concerns about our so called energy market. It isn’t delivering security of supply or tackling high energy prices as Which? highlighted yesterday. We need more than modest energy market reform to break DECC out of its complacency.